A range of figures designed to be used in the era of the Pulp adventure and early 20th Century horror. 20mm Pulp Elhiem x2 Amateur Sleuths Husband and wife team? Boffins? Spys? Detectives? 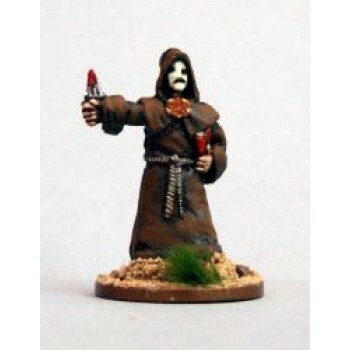 Useful male an..
20mm Pulp Elhiem x1 American Adventurer inspired by many american Pulp heroes our rough and ready he..
20mm Pulp Elhiem x3 Arabesque figures Swathed head to foot in robes. Armed with Mauser pistol, Sword..
20mm Pulp Elhiem x1 One big suckered tentacled to add to scenery..
20mm Pulp Elhiem x2 Count and Countess vampires in classic attire..
20mm Pulp Elhiem x1 Creepy rough stone Altar with blood drainage grove....creepy..
20mm Pulp Elhiem x1 Cultist Leader behind his sinister mask who is the Cult Leader?.. 20mm Pulp Elhiem x3 Damsels in Distress..
20mm Pulp Elhiem x2 Dr Goodfoot and his undead witch..
20mm Pulp Elhiem x1 Fishman in Disguise undergoing massive surgery this Fishman almost passes as hum..
20mm Pulp Elhiem x1 Helga the Milkmaid..
20mm Pulp Elhiem x5 Heroes and Agents a selection of figures (sculpted by Mystic Spirals) that can b..
20mm Pulp Elhiem x3 Heroic Pilots includes 1 Heroic female, 1 hero and 1 faithfull (huge) sidekick w..
20mm Pulp Elhiem x3 Holy Trinity includes two Priests in casual attire armed with Holy Items (and a ..
20mm Pulp Elhiem x3 Hooded Cultist 1 in hooded cowls and creepy masks armed with 1x Tommy Gun, 1x Sp..
20mm Pulp Elhiem x2 Hooded Cultist 2 with hooded cowls and creepy masks. Armed with a Mauser rifle t..
20mm Pulp Elhiem x2 Horror Slugs two wonderful grotesque Horror Slugs. Can be used as almost any sca..
20mm Pulp Elhiem x1 Lesser Fishman standing half the hieght of a Man these slimey creatures are not ..
20mm Pulp Elhiem x3 Merchent Seamen captain with revolver, deck hand with rifle and cabin boy with S..
20mm Pulp Elhiem x1 Mr Tentacles is a hidious mutation between man and squid, his limbs transformed ..
20mm Pulp Elhiem x2 Mummy and Werewolf from the crypts of Ancient Egypt the Mummy rises! The Werewol..
20mm Pulp Elhiem x1 MZ Whip figure Tall and lean, this attractive lady likes to maintain discipline ..
20mm Pulp Elhiem x1 weird fishy priest with Octopus head..
20mm Pulp Elhiem x2 Hard Boiled Private Detectives, Gangsters or Spys in Rain Coats..
20mm Pulp Elhiem x4 unique Alsation dogs sitting, biting, standing and leaping. No bases for max use..
20mm Pulp Elhiem x2 Rabbi and Clay Golem figures Inspired by the legends of Rabbis and their Golem c..
20mm Pulp Elhiem x1 Retro Rocket Man with Ray Gun..
20mm Pulp Elhiem x4 Rocket men armed with broomhandle mauser pistols and Drum magazine Thompson SMG..
20mm Pulp Elhiem x4 Scientist, Professor, Nurse & Patient includes a doctor/Scientist with needle. A..
20mm Pulp Elhiem x1 Shapeless Worm Creature Blob like shape changed. Add tentacles to make more wier..
20mm Pulp Elhiem x6 small Tentacles to add to scenery or creatures..
20mm Pulp Elhiem x7 female Vamp temptresses or are they Vampires? Paint them with warm or cold flesh..
20mm Pulp Elhiem x1 Weird Growth odd shell/bone limpet growth to be tuck to floors, cielings etc. Co..